With Valentine's Day right around the corner (less than a month away! ), I thought I would share the fun valentine that I made for a blogger valentine's exchange last year. Last year, we sent our friends a Starburst puzzle that I saw advertised in Parents Magazine. Seriously one of the easiest and cutest valentine's I've ever seen. I downloaded the template from parents.com, printed them on sticky paper, cut them out, and stuck them on Starbursts. 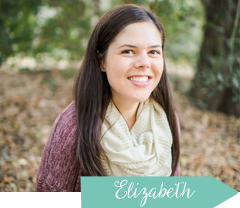 Easy peasy, super cute, and fun! 1. Print off (or save) puzzle printables. These are the printables that I used. This first one is for the puzzle itself. And I used this printable below for the "wrapping" portion of the valentine. 2. 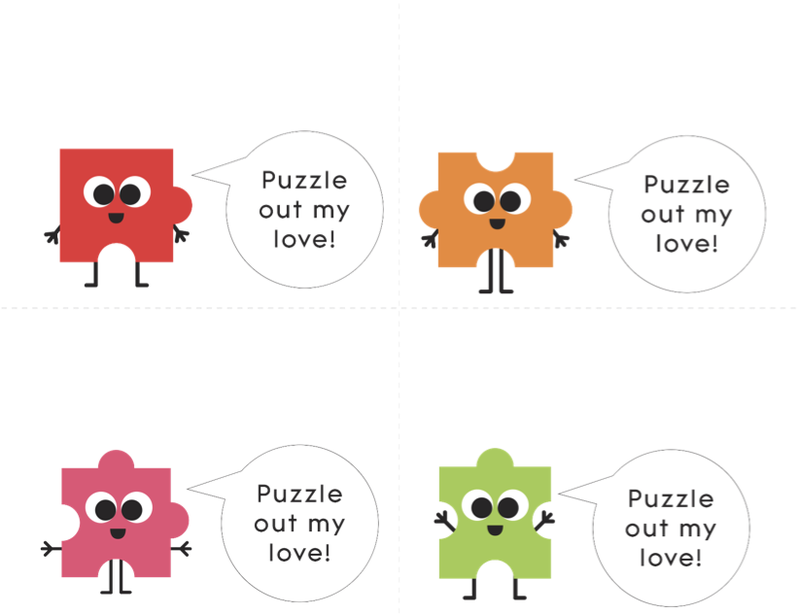 Print the puzzles onto "sticker paper" or labels of some sort. I went to the store looking for a whole sheet sticker label but I couldn't find one. I knew that I couldn't use regular labels since the puzzles would be all cut up and on different stickers so I looked around to see what they had. I ended up settling on a sticker label sheet that had four big labels (like shipping label size). A couple of the puzzles printed on the "crack" so I couldn't use them but I just printed two sets and it was perfect. 3. I cut apart the puzzles and stuck the pieces on different color Starbursts. I prefer the "reds" collection since they are my favorite, but you could easily use the regular ones or any flavor that's your favorite. 4. 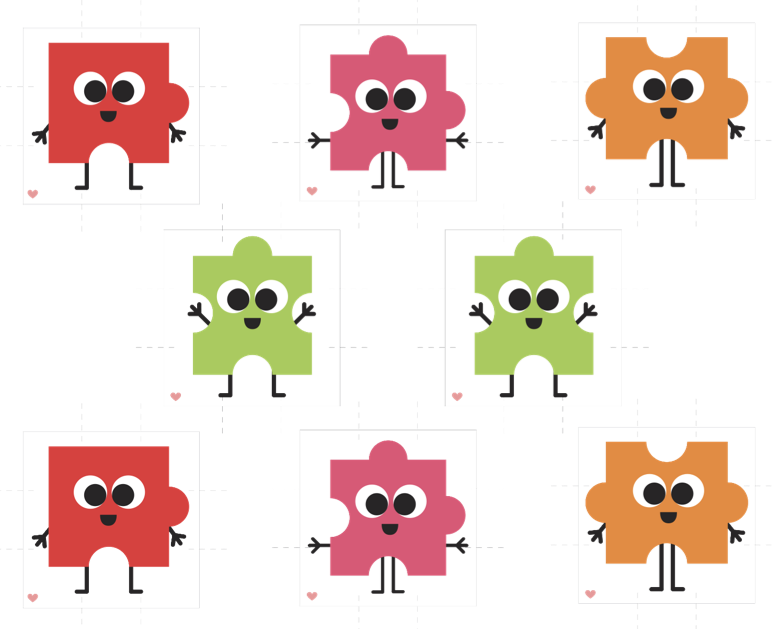 Once you have all the puzzle pieces finished, mix up the pieces and put them in a snack size plastic bag with a backer (it shows what the puzzle should look like when it is put together correctly so it gives the kids a guideline). 5. 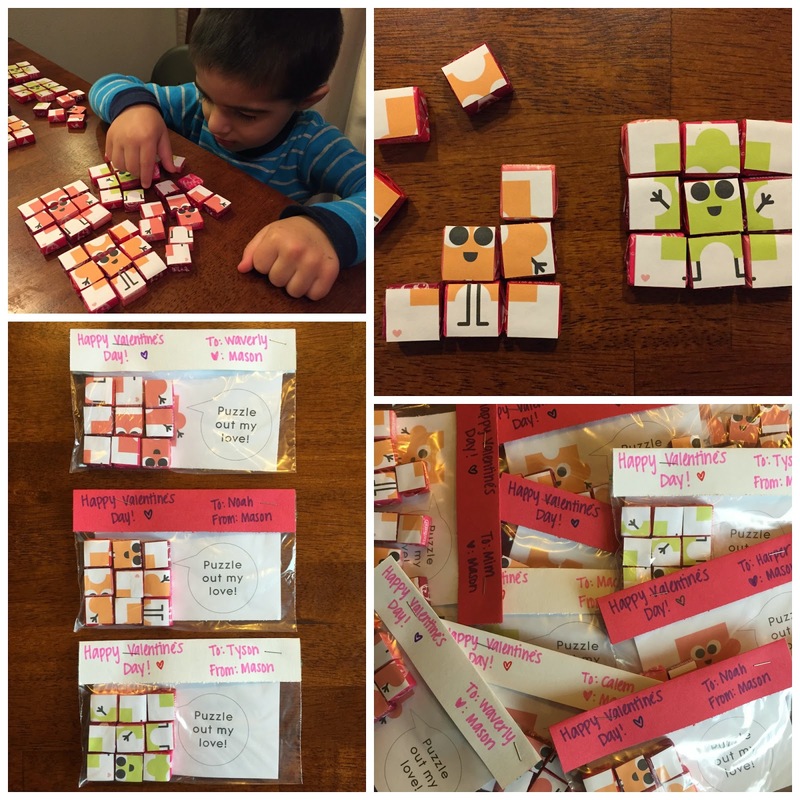 Cut a couple strips of construction paper to make the portion that you will write the kids names on. I just cut small strips, folded them in half and wrote a simple "Happy Valentine's Day" and a "to" and "from". And voila! 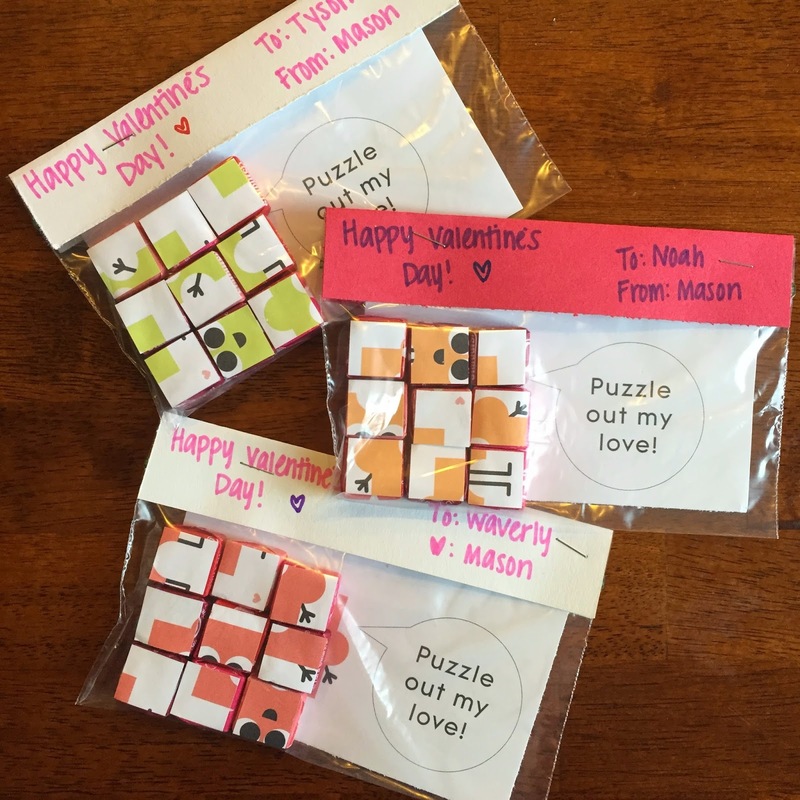 The perfect valentine for your kid's friends or classmates at school! That is adorable!!! Can't wait to see what you do this year. Not sure mine will be quite as cute. Ha ha! One of Noah's favorites to receive last year... 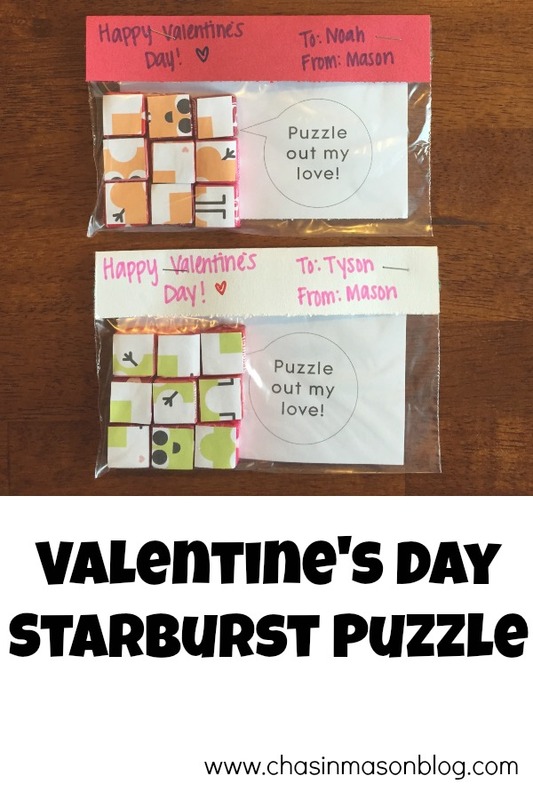 He's obsessed with puzzles and I think that started his love of starbursts :). Excited to see what you do this year! Gah, those are so cute! Henry's school won't let the kids do candy anymore. I'm kind of bummed! These would be so fun! I remember these from last year and I still think they are just THE CUTEST!!!! I really wanted to make them for our blogger exchange, but seeing you already sent them to all the same people last year, I settled on something else. These were one of my FAVES!!! LOVE!!! You are so creative! I love these!!! shut up! this is the cutest EVER!!! I thought that exchange you guys did last year is was so cute! And this one is so perfect because it gives an activity AND a treat! This was definitely one of your most pinworthy moments!! ;) love it!! 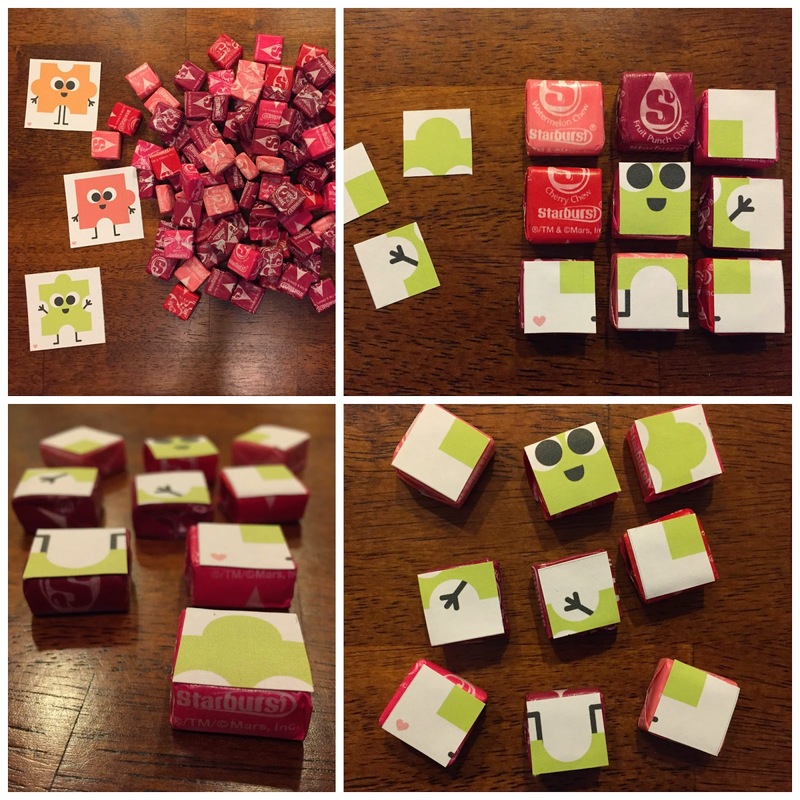 Those are seriously so cute and Starbursts are a household favorite. Love this idea! I LOVED this last year! It was the cutest idea ever!! I LOVE THIS and plan to steal it if I can come up with a reason to do so. We already have C's Valentine's planned thanks to James (and I'm not a fan). These are too too cute!!! I already have all of my Vday cards mostly done, but these are too cute not to do.